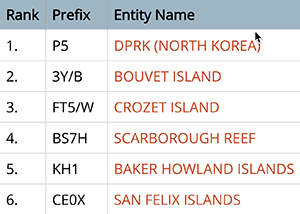 Baker-Howland is currently the 5th most wanted DXCC entity in the world. As with any DXpedition to the really rare ones, this will be another financially demanding operation, with an expected budget of $400,000. We welcome your financial support. You can help make this DXpedition happen by donating via credit card, PayPal, personal check or money order. Your callsign, club name, foundation, etc. will be listed on one of our Sponsor pages. Dateline DX Association has a policy of uploading all pre-QRV donor's QSOs to LoTW when we return from the DXpedition and are confident the logs are correct. We expect this to be about 10 days after we QRT (it's a long boat and plane ride home). It is our special thanks for those who support us to get there. We thank you in advance for supporting our 2018 DXpedition to Baker Island! Enter Your Call Sign & Click "Donate"
Would you like your contribution to be tax-deductible? Please write "Directed Contribution-Baker 2018" somehere on your check. Since NCDXF which is registered as a 501(c)(3) non-profit organization, your contribution should be tax deductible, but please consult your tax advisor.